Book Review: All Fall Down (Embassy Row #1) by Ally Carter + Giveaway! The thing is, nobody else believes her and there’s no-one she can trust. Not her grandfather, a powerful ambassador. Not her new friends, who all live on Embassy Row. Not Alexei, the Russian boy next door, who is keeping his eye on Grace for reasons she neither likes nor understands. I grew up with Ally Carter so can you imagine my excitement when I heard about All Fall Down? Yes, it was through the roof! And can you imagine that excitement after I received a copy for review from Scholastic? Yup, I was one happy Joy. All Fall Down did bring me back to my time as a young reader, but that was both a good and bad thing. I felt like I was back in high school again, but I also felt extremely old as well because I’ve grown up so much since then. I’m not sure whether I’ve outgrown Ally Carter’s writing style or if the characters were just written to be younger than they seemed. Regardless of that though, I did end up enjoying All Fall Down and it was a quick and fun read. 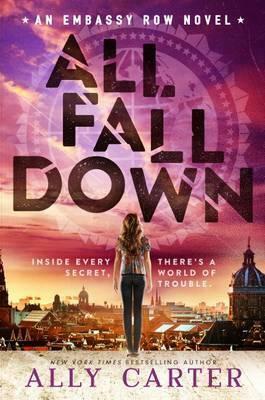 All Fall Down follows Grace Blakeley who’s just returned to live with her grandfather in a small made-up country called Valencia. Situated in the Mediterranean, its capital holds a row of embassy houses where many of the worlds ambassadors reside. With her father in the military and her brother training for it, Grace returns to her once-summer home to face her PTSD demons and attempt to move on from the ‘accident’ that killed her mother three years ago. Unfortunately it’s hard to let go of the past when she discovers that the scarred faced man who shot her mother is now the private security guard to the prime minister…and he’s about to kill again. Grace was a very sassy character but she was also very stubborn and reckless. As a child she had the tendency to get into a lot of trouble and is not any different as a teenager. Although she’s reckless in her actions, she understands that she’s being reckless, but her determination to catch her mother’s murderer surpasses her own logic. I admired this determination because it showed her strength and belief in her own mind even when everyone around her thought she was ‘crazy’. There’s a cast of secondary characters that help Grace along the way. These kids reside in other embassies near Grace such as Germany, Russia and Israel. Unfortunately, I found them a little flat and could have been fleshed out so much more. In reality, they were there to do the hard tasks like breaking into secured computer networks for Grace. There was also so much potential to explore the politics and relationships between the different embassies further. I do understand that politics do not appeal to young readers, though it would have been nice to see more of it. Much of the story focused on Grace’s PTSD and I think Ally Carter explored it very well. As the reader, you yourself are unsure of whether Grace’s memories are even reliable, and whether she is on a wild-goose chase as everyone around her suggests. Grace doesn’t want to believe she’s crazy, but all the evidence does point towards it. The ending, while predictable, does wrap up very nicely. I feel like I’ve read too many of Ally’s books to be thoroughly surprised, but I still enjoy the ride her books take me on. All Fall Down is a very fun mystery for fans of Ally Carter. This is the book to pick up if you’re new to the YA and mystery genres and want to try them out! Thank you to Scholastic Australia for providing a copy in exchange for an honest review.